The Czech Republic midfielder had been sidelined with a knee injury before receiving a huge ovation as he replaced Alex Iwobi against Burnley, featuring for Arsenal for the first time in seven months. 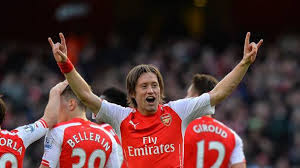 Rosicky’s afternoon ended with a thigh strain, but the 35-year-old says he will always have good memories of how he was welcomed back. “It was unbelievable, something I didn’t expect,” he told Arsenal Player. “Since the moment I started to warm up on the sidelines it was exceptional. Honestly, I had tears in my eyes after such a long time being out. “I started to warm up and the reception was unbelievable and I will never forget it. Obviously it is the worse thing [getting injured again] and the feeling I cannot give the fans anything back at the moment is frustrating. “It’s been a hard few days for me to accept. Sometimes you always say that you can always do better or that you can always improve more and more, but I don’t know what more I could have done.